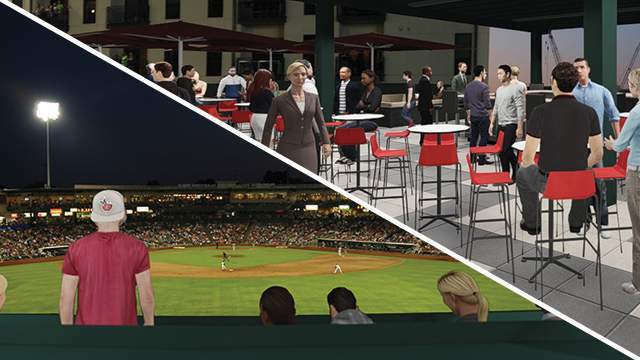 The Fort Wayne TinCaps are adding a new group seating area atop the Tuthill 400 Club behind the center-field fence at Parkview Field, the baseball team said today. The new section will be called The Summit and will be a deck located on top of the existing 400 Club, the TinCaps said in a statement. Construction for the $600,000 project will begin this fall and is privately financed by Hardball Capital, the owners of the TinCaps, the statement said. No money from the Parkview Field Ballpark Maintenance and Improvement Fund will be used for the construction, it said. The Summit, presented by Tuthill, will be the only batter's-eye rooftop deck in the country, the statement said, and is expected to be ready for Opening Day 2016 on April 9. It will accommodate up to 125 people in an open-air setting that will have both ballpark seating and club-style seating. "We’re extremely excited to be adding The Summit, presented by Tuthill to Parkview Field," TinCaps President Mike Nutter said in the statement. "Parkview Field has been a tremendous success and we are committed to continuing to invest and improve this community icon. We are proud to do this in partnership with Tuthill, a company that shares our commitment to community and to excellence." Groups wanting to reserve The Summit may call 260-482-6400 or go online at TinCaps.com. Reservations will be accepted beginning Nov. 2.